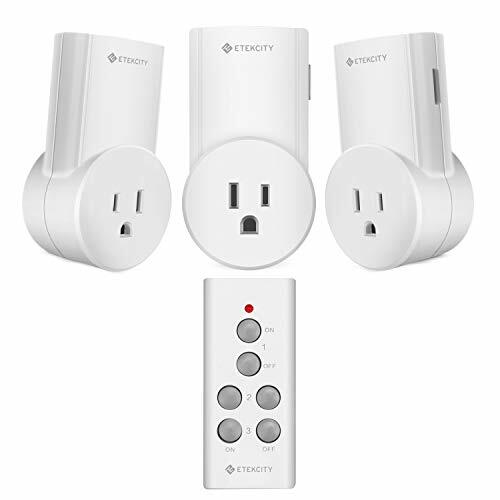 The Etekcity Remote Control Outlet Switch Kit works from as far as 100 feet and is great for switching on/off hard-to-reach appliances and devices without built-in power switches. It operates household appliances from across rooms and can be a great assistant to the mobility impaired. Many household electronics and appliances consume electricity even when not in use - wasting valuable energy and increasing your electric bill. Standby energy consumption can average up to $100 a year in unnecessary energy costs in a standard American household. By using this Etekcity Remote Control Outlet Switch Kit to power everyday electronic devices such as stereos, chargers, microwaves, and even christmas lights, it's easy to take control for the best energy efficiency. If you have any questions about this product by Etekcity, contact us by completing and submitting the form below. If you are looking for a specif part number, please include it with your message.